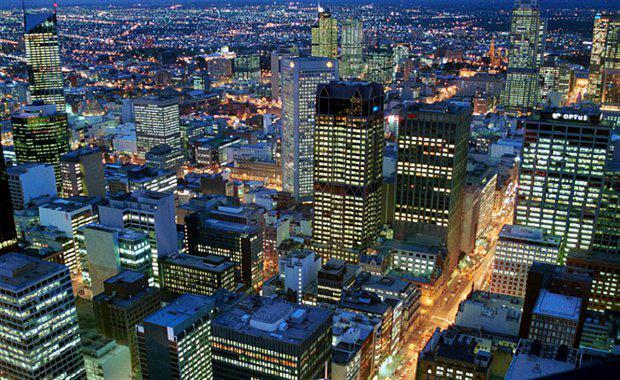 The latest research from Savills revealed preliminary office leasing figures for Melbourne’s CBD show a massive rise of circa 128 per cent over the 12 months to March, with the Government and Community sector taking 38 per cent of the space. 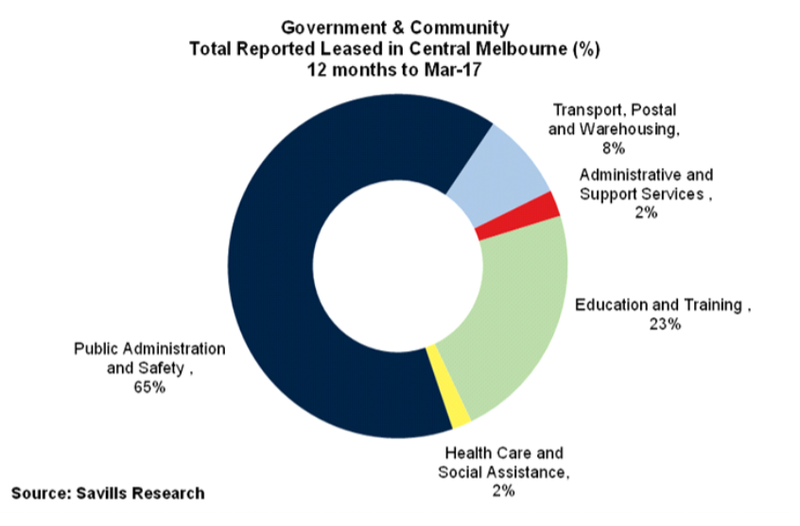 Around 569,810 square metres of leasing activity was recorded in the Central Melbourne office market in the last 12 months, with population growth and infrastructure projects marked as important market drivers. "This is up 128 per cent on the 250,000 square metres leased in the 12 months prior, and also up on the five year average of 269,943 square metres, so these are quite remarkable figures in anybody’s language,’’ Savills Associate Director of Research Monica Mondkar said. 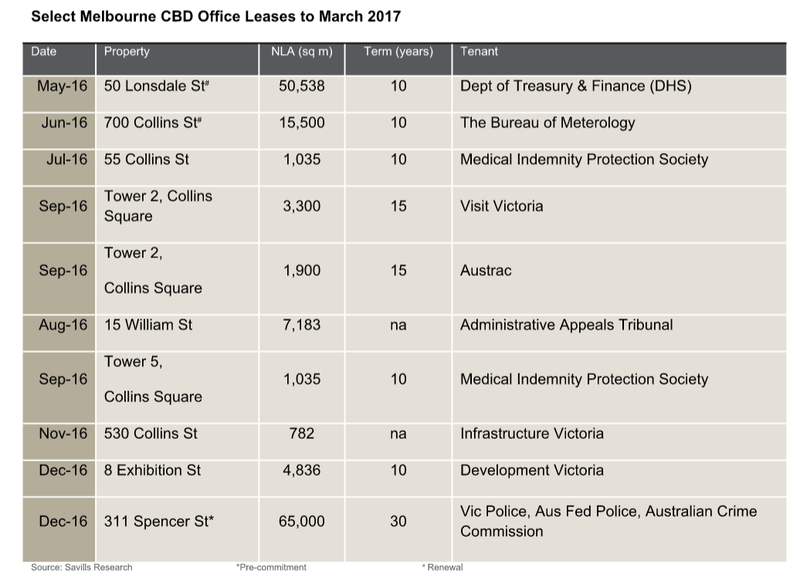 The Government & Community sector was the dominant sector leasing 224,906 square metres, 83 per cent of which was Prime Grade. Direct leases totalled 77,868 square metres, while 81,000 square metres was pre-committed. Public administration was the largest sub-sector accounting for 65 per cent of the space taken-up under the Government & Community sector, followed by Education at 23 per cent. Ms Mondkar said Property & Business Services was the next largest leasing sector at 28 per cent followed by IT & Communication at 15 per cent and Finance and Insurance at 13 per cent. Director Office Leasing Phil Cullity said there were a number of factors behind the massive rise in leasing including the renewal of government leases, consolidation of government departments, population growth, government infrastructure projects, staff retention and recruitment requirements, and efficiency gains. He said sound advice to government departments on the full planning and management of individual leasing requirements had also been an important factor. "Overall governments – state and federal – have underpinned the massive take up with population growth also an important part of the equation. "Last year net absorption was 117,000 square metres which smashed the 10 year, 86,000 square metre, average and all indications are that we are in for another 12 months like that. "It’s then really no surprise that developers are pushing ahead with new buildings especially with economic rents being achieved,’’ Mr Cullity said. Mr Cullity said during the GFC years of 2008/2009/2010 government departments had not upgraded their space because there were fewer options to go to. "A lot of government leases have recently come up for renewal at the same time and they are well overdue to move into better quality, more efficient space. "The State Government, in particular, has been proactive in taking advantage of market conditions, locking in rents and incentives, before rents begin to rise. "Governments now realise that, as they are in competition with the private sector for the best young talent, they must offer a similar level of accommodation and that includes the latest building services including end of trip facilities, meeting facilities, amenities and access to transport, cafes,’’ Mr Cullity said. He said government tenants were also increasingly mindful of the need for more efficient buildings in reducing costs. Mr Cullity said the State Government’s current infrastructure program including level crossing removals, the Metro Tunnel and the Western Distributor, had also been important in driving the overall leasing market. "This is not so much about government leases. While there have been some, there have been many corporates leasing additional space associated with these projects and this will have an impact on the market over the long term,’’ Mr Cullity said.